Visioning Technologiesbrings together a collection of texts from leading theorists to examine how architecture has been, and is, reframed and restructured by the visual and theoretical frameworks introduced by different ‘technologies of sight’ – understood to include orthographic projection, perspective drawing, telescopic devices, photography, film and computer visualization, amongst others. Each chapter deals with its own area and historical period of expertise, organized sequentially to mark out and analyse the historical evolution of how architecture has been transformed by technologically induced shifts in human perception from the 15th century until today. 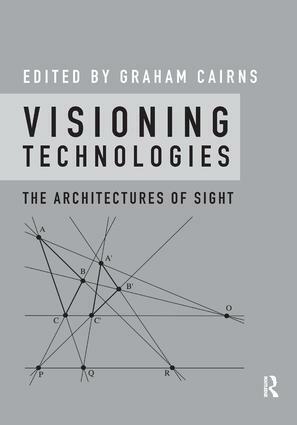 This book underlines the way in which architectural forms and design processes have developed historically in conjunction with the systems of sight we manufacture technologically and suggests this continues today. Paradoxically, it is premised on the argument that these technological systems tend, in their initial formulations, to obtain ever greater realism in our visualizations of the physical world. Graham Cairns is an academic and author in the field of architecture who has written extensively on film, advertising and political communication. He has held Visiting Professor positions at universities in Spain, the UK, Mexico, the Gambia, South Africa and the US. He has worked in architectural studios in London and Hong Kong and previously founded and ran a performing arts organization, Hybrid Artworks, specializing in video installation and performance writing. He is author and editor of multiple books and articles on architecture as both a form of visual culture and a socio-political construct. He developed this book during a two year period as Visiting Scholar at Columbia University, New York. He is currently director of the academic research organization AMPS (Architecture, Media, Politics, Society), and Executive Editor of its associated journal Architecture_MPS. He is Honorary Senior Research Associate at the Bartlett School of Architecture, University College London, UK.